Leanne Briscoe, for the Respondent. DAWSON J.:– The applicant’s request for an order of mandamus is allowed because the delay in question has been longer than the nature of the process prima facie requires, neither the applicant nor his counsel are responsible for the delay, and the Minister has not provided a satisfactory justification for the delay. On October 17, 2004, Rajaluxmy Subaharan (a permanent resident of Canada) sponsored the application of her husband, Subramaniam Subaharan, for residence in Canada. While the sponsorship was initially refused by the visa post in Colombo, Sri Lanka, on March 20, 2006, the Immigration Appeal Division of the Immigration Refugee Board allowed an appeal of that finding. The visa post then resumed processing the application. Over two and one half years has elapsed since then. Citizenship and Immigration Canada currently advises that the visa post in Colombo finalizes 50% of the family class (spouses and partners) applications for permanent residence that it receives within six months. 80% are finalized in nine months. The website does caution that past processing times may not be indicative of future processing times. Mr. Subaharan’s application was complicated by the fact that on June 27, 2000 he was convicted in Hong Kong of the offense of possession of a forged travel document. He was sentenced to six months imprisonment. He says that he was caught while in transit to the United States in order to make a refugee claim. 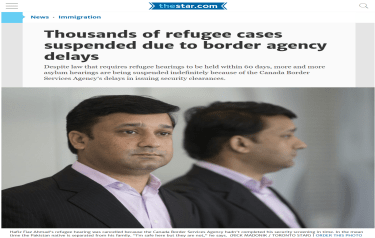 No affidavit was filed on the Minister’s behalf, but it appears from the Computer Assisted Immigration Processing System (CAIPS) notes that this conviction gave rise to concern as to whether Mr. Subaharan was inadmissible to Canada. The CAIPS notes record that, as of August 14, 2006, the visa post required the “charge sheet and conviction order” from Hong Kong. By November 7, 2006, the visa post had received two letters from the Hong Kong Police Force. One advised that they were unable to advise that Mr. Subaharan had no criminal convictions in Hong Kong. The other advised that on June 27, 2000, he received a sentence of six months imprisonment in respect of the offense of possession of a forged travel document. It was noted that this related to subparagraph “42(2)(c)(i) Cap 115”. Thereafter, the CAIPS notes show confusion on the part of the visa post. On July 31, 2007, an entry reads “was PI convicted or only charged? What was the outcome of the charges? [We] need answers to these in order to take a decision.” The answers had previously been received from the Hong Kong Police Force. WAS PI CHARGED OR CONVICTED? WD ALSO NEED THE EXACT WORDING OF S. 42(2)(c)(i) Cap 115 OF THE HONG KONG CRIMINAL CODE IN ORDER TO FIND EQUALENCY [sic] UNDER THE CANADIAN CRIMINAL CODE. Subject is an applicant under the FC1 category. We have a Police Record (see attachment) stating that subject was in possession of a forged travel document and was imprisoned for 6 months. He was charged under s. 42(2)(c)(i) Cap 115. The exact wording of s. 42(2)(c)(i) Cap 115 of the Hong Kong Criminal Code in order to find the equalency [sic] under the Canadian Criminal Code. On March 6, 2008, the text of the relevant provision of the Hong Kong Criminal Code was received from the Hong Kong mission. The CAIPS notes do not record any significant progress after this. As a matter of law, the parties are agreed that the principles that govern the grant of mandamus are those articulated by the Federal Court of Appeal in Apotex Inc. v. Canada (Attorney General),  1 F.C. 742. They further agree that the specific principle relevant to this case is the requirement that the applicant establishes a clear right to the performance of the requested duty, and more particularly the requirement that the applicant establish that a reasonable amount of time has elapsed for the performance of the duty. the authority responsible for the delay has not provided a satisfactory justification. No issue arises in this case with respect to the second element of the test. The delay, to date, of over 2 1/2 years since the Immigration Appeal Division allowed the appeal, is far in excess of normal processing times. For a great period of that time (from November 7, 2006 forward) much of the information sought by the visa post was already in its possession. It took the visa post from November 7, 2006 to March 6, 2008 to obtain the text of part of a public statute. After March 6, 2008, there is no evidence of any effort to process, that is reach a decision upon, the information that had been obtained. It is not apparent from the CAIPS notes that any other information was required by the visa post. The Minister has not provided evidence to that effect. I conclude from this evidence that the delay has been longer than prima facie required and that there is no satisfactory explanation for the delay. The application for judicial review will, therefore, be allowed. Costs are generally not awarded in applications for leave and for judicial review brought in the context of the Immigration and Refugee Protection Act, S.C. 2001, c. 27 (“Act”). This is because Rule 22 of the Federal Court Immigration and Refugee Protection Rules, SOR/2002-232 (“Rules”) provides that no costs shall be awarded in proceedings under the Rules “unless the Court, for special reasons, so orders”. The jurisprudence of the Court that has considered this rule, and its predecessor, is to the effect that a finding that an order of mandamus is warranted is not, by itself, sufficient to justify the award of costs. See, for example, Kalachnikov v. Canada (Minister of Citizenship and Immigration) (2003), 236 F.T.R. 142 (T.D.). Each request for costs will turn upon the particular circumstances of the case. While Mr. Subaharan’s application has not been processed speedily, I have not been persuaded that the pace was so slow as to give rise to special circumstances and an award of costs. There is no evidence of conduct that is unfair, oppressive, improper or actuated by bad faith. No costs are awarded. The respondent shall process Mr. Subaharan’s application for permanent residence in Canada and provide him with a decision with respect to the application within 90 days of this judgment. The period for making the decision shall be subject to further extension by the Court, on motion made by the respondent, if the respondent applies for such extension before the expiration of the 90-day period, and if the respondent is able to establish on evidence that such further time is required due to causes or circumstances beyond his control.